← Jurable or Merely Fashionable? 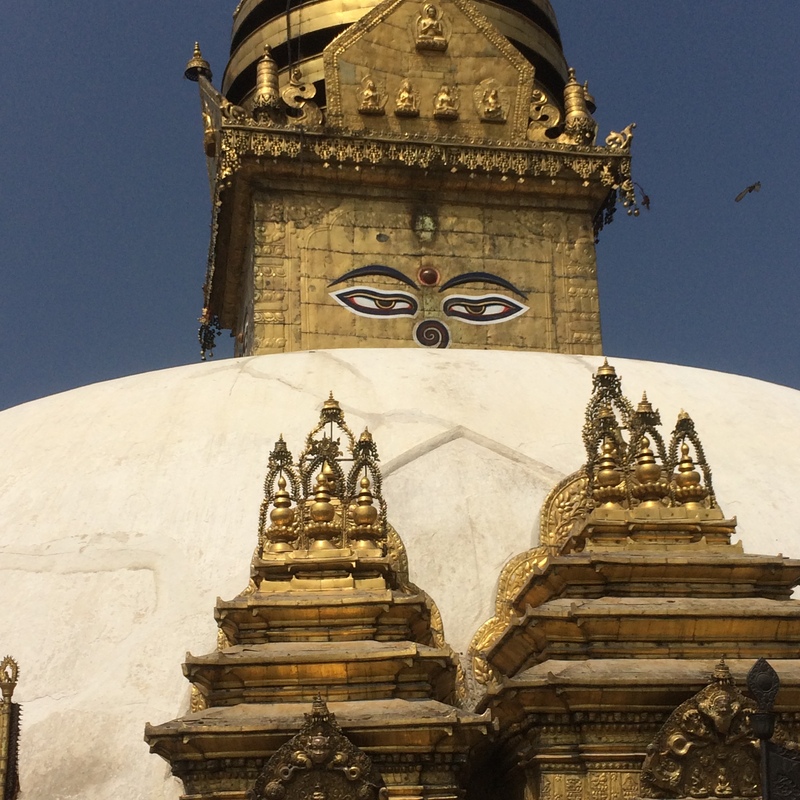 I’m just returned from spending the best part of March in Nepal (hence the lack of posts here). It’s my third trip there, and the second in two years. People like to know what it’s like, and I always answer along the lines that it’s both challenging and stimulating, but that the latter outweighs the former. You can get used to no hot water, even no water at times, along with the other privations and deviations from our pampered Western expectations (sixteen hour electricity outages are common every day in the capital). You can’t get used to the dust, and in Kathmandu, the terrible pollution, but you can put up with it. You can also show a philosophical resolve against the near inevitability of getting sick from something you ate. But little prepares the first time visitor for the sheer colour of the Nepal experience – people, temples and shrines, flora and fauna, landscapes, and above all, the astounding mountains. Yet I do weep for Nepal, a country in which half the population earns less than a dollar a day (ranked 140th in terms of world poverty). After a decade or so of civil war, 2015 saw first a major earthquake, and then a blockade on the Indian border which deprived the country of gas, kerosene and petrol. The streets were quiet and people were cooking on open fires on their balconies and terraces. There is wealth, serious private wealth if you look beneath the veneer. The officials with whom the wealthy Western diplomats and employees of the NGOs mix live in almost hidden gated communities, drive 4WDs and dine in smart restaurants serving Western food and alcohol at highly taxed prices. But there’s little infrastructure. 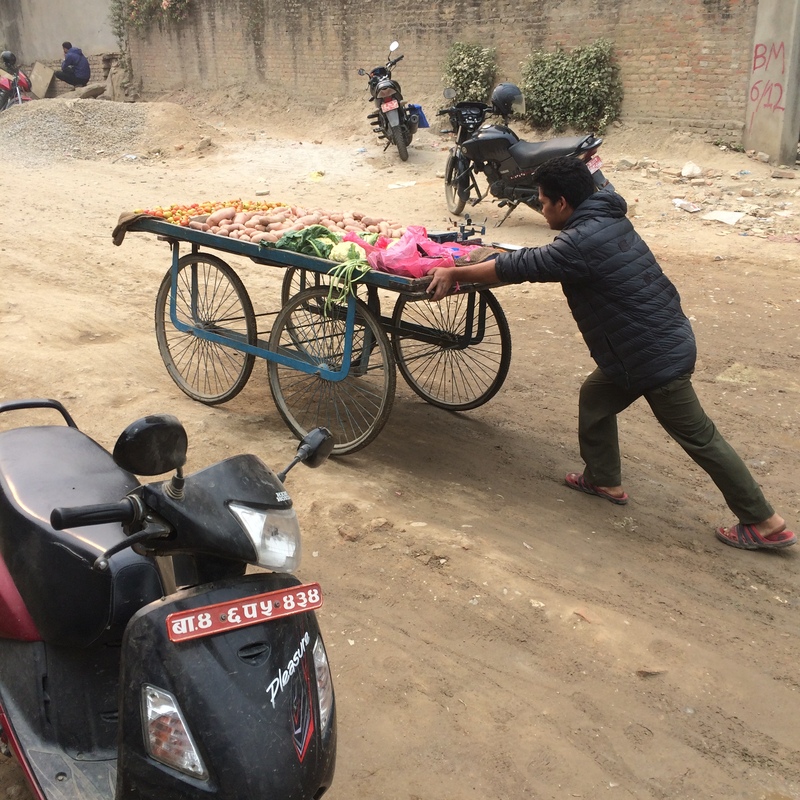 Kathmandu’s ring road is one long, wide, dirt track choked with traffic at a standstill – thousands of motor bikes jostling with taxis, buses, lorries and carts. There are no rules, apart from the occasional policeman’s whistle trying to bring order at traffic light free intersections. So don’t expect a wine industry here. There is one, of sorts, but not in the sense we understand. There’s a long tradition of commercial fruit wine production, based on fruits and herbs. 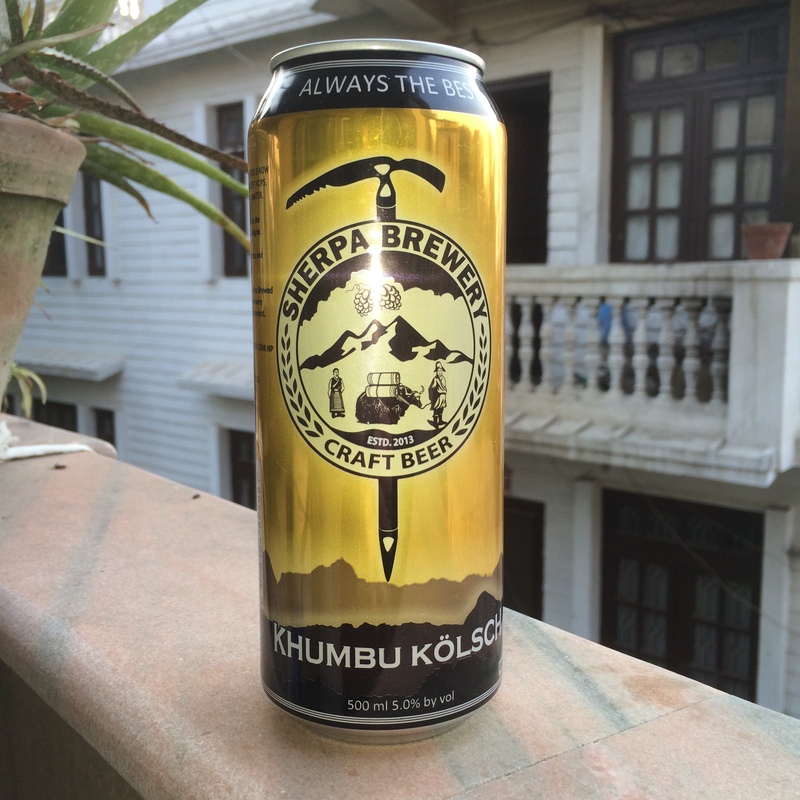 It’s not the kind of thing to interest most wine lovers, but it can provide an occasional alternative to the more satisfying local beers, such as Gorkha, or Sherpa (billed as Nepal’s first ever craft beer, and my favourite thirst quencher there). 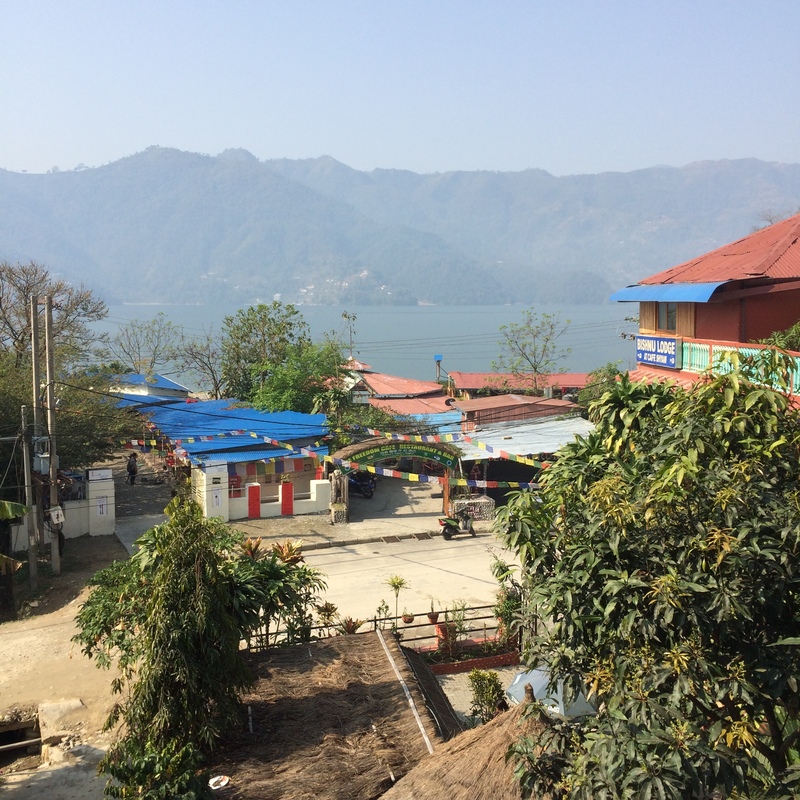 We spent a week on the lakeside at Pokhara, about a seven hour drive west, down the fertile Kathmandu Valley. It’s an idyllic place, a large lake surrounded by hills and, in the morning light, magnificent views of the Annapurnas and Machhapuchhare (“Mount Fishtail”). It was in what is probably Pokhara’s most expensive supermarket that we found Hill Hut Winery’s “Dandaghare Pindhi Herbal Dry”. 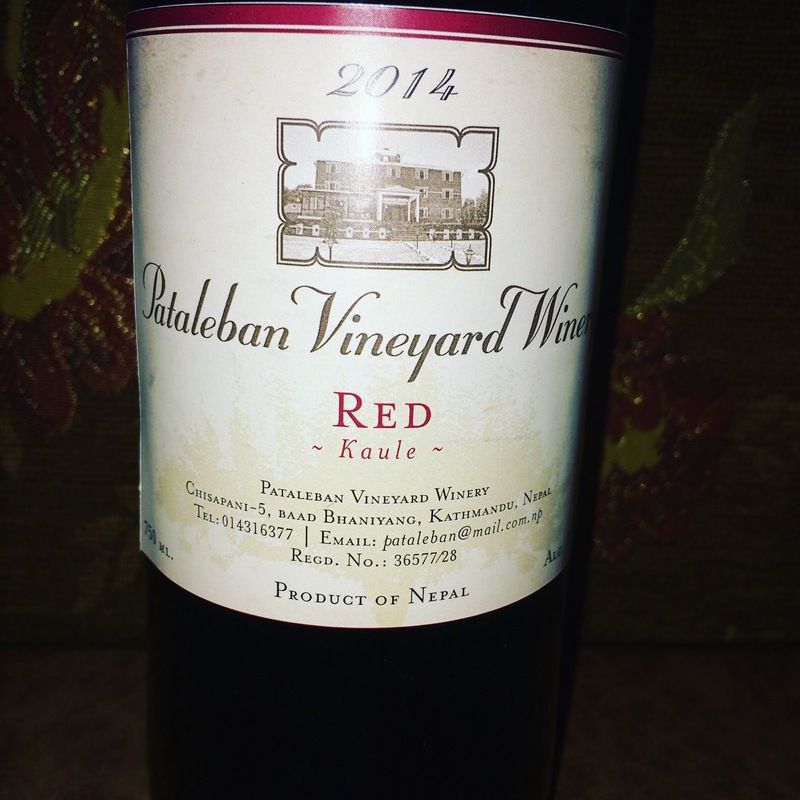 They described it as a sweet red, made from “fruits, roots, herbs and honey”. To be more accurate, the colour was mid-tawny, not red, but it was reasonably drinkable. Imagine a Palomino table wine (not remotely like anything Equipo Navazos would make, I should say, though I am thinking unfortified Sherry) to which has been added a good large tablespoon of honey. Although it’s hard to be totally objective in such a beautiful location, you’d finish the bottle, though perhaps not dash out to buy more. They managed 11.6% alcohol. 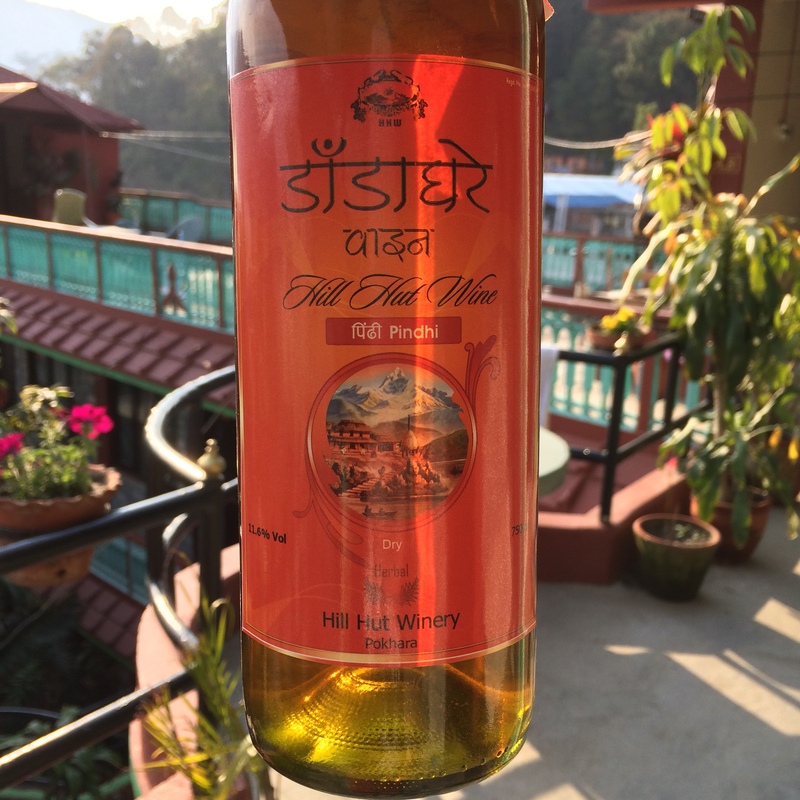 I will say, this was significantly nicer than any other fruit wine we’ve had in Nepal. When you return by road to Kathmandu you spend most of the day following the Trisuli river, well known in parts for its white water rafting. The valley is lush, even long before the monsoon rains turn it into a sea of rice terraces. Roadside stalls sell river fish and fruit. You pass beautiful villages up the valley sides, like Bandipur where, if you jump out of bed before dawn, you can go to watch the sun rise over the white peaks of the Manaslu Himal to the north. If you stop at Manakamana you can ascend ten minutes in the modern cable car (made moderately famous by the 2014 “slowfilm” of the same name, by Stephanie Spray and Pacho Velez – “You could hardly ask for a more beautiful vision of souls in transit” : Time Out Magazine) to the temple to the fearsome goddess, Bagwati (an incarnation of Parvati) whose power to grant newly weds a male child comes at the price of sacrifice. The Austrian-built cable car survived the 2015 earthquake. The temple didn’t, nor did those inside it at the time. The temple is being rebuilt, but the sacrifices are still taking place. As you approach Kathmandu the road rises steeply between Naubise and Thankot. On these hairpins the inevitable breakdown of heavily laden lorries causes jams lasting hours. As you begin to crest the hill there is a turn-off to the settlement of Chisapani. 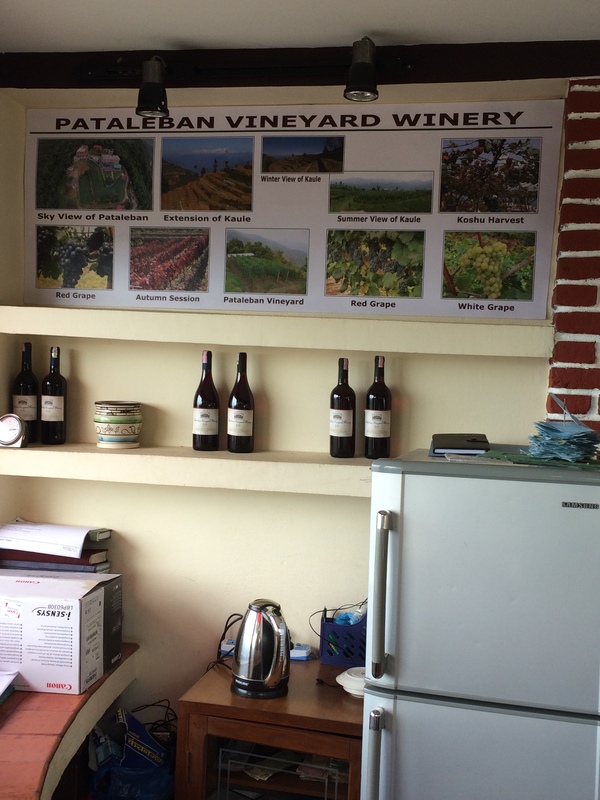 Here you will find the Pataleban Resort and Vineyard. It’s the only commercial vineyard producing its own wine in the country. 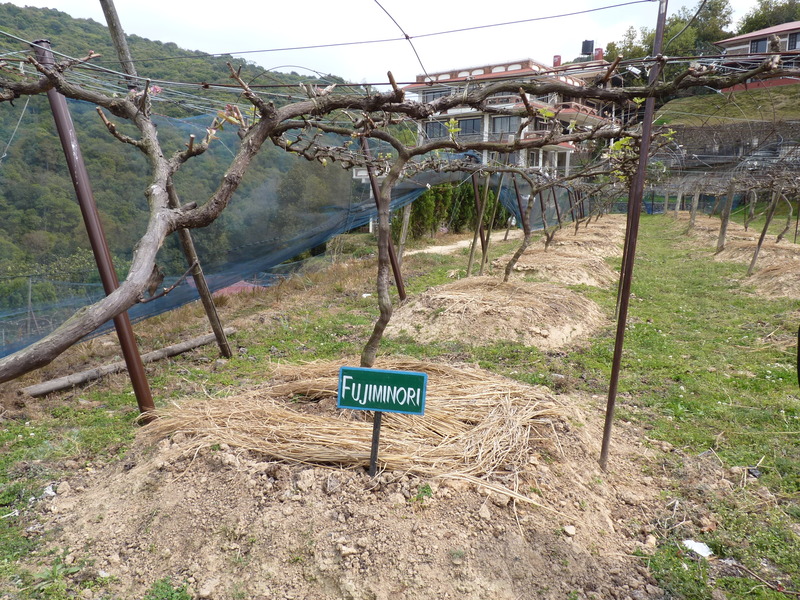 There are around 2ha of vines on the Chisapani site, but there are two other sites nearby. 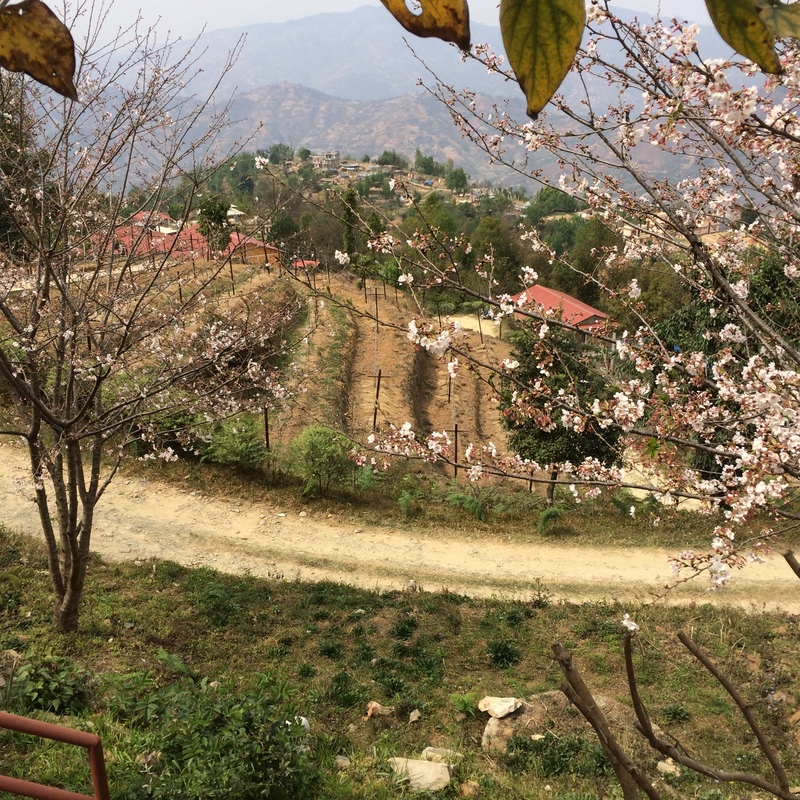 The vineyard was founded in 2007 by Kumar Karki, with strong involvement from Japan. This is why, among the seventeen grape varieties being trialled at Pataleban (everything from Delaware and Muscat Bailey A to Chardonnay) there are several Japanese varieties and crosses (including Koshu). They make a red, white and rosé, but production currently only stands at around 3,500 bottles per year, almost all sold to guests at the exclusive resort hotel. The challenges faced by the staff here are considerable. The grapes are all trained on a widely spaced high cordon and netted against birds, monkeys, and the occasional leopard. Harvest (they only crop once a year, unlike some parts of India) comes at monsoon time. Imagine that, bearing in mind the stress to producers which a bit of rain causes on the Cote d’Or! When we visited, the white and pink were sold out, but the red proved to be both palatable and interesting. All the winemaking equipment has to be imported. I think much comes from Germany. The wine is clearly well made, the grape variety being Khainori (a cross between Pinot Noir and Khaiji) grown in the estate’s Kaule vineyard. It has that kind of hybrid flavour you get so often with indigenous reds in Japan, a strawberry/raspberry fruit with a kind of foxy/woody note on the finish. 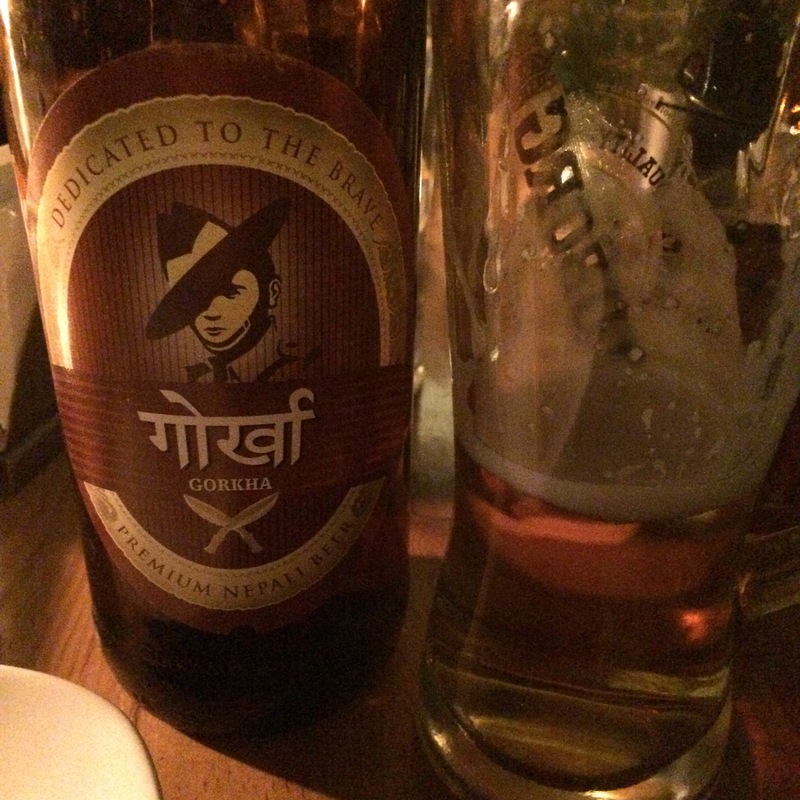 It doesn’t lack balanced acidity and is refreshing and quite light. It costs 1,700Rs, a princely sum in Nepal, yet equating to about £11-£12. 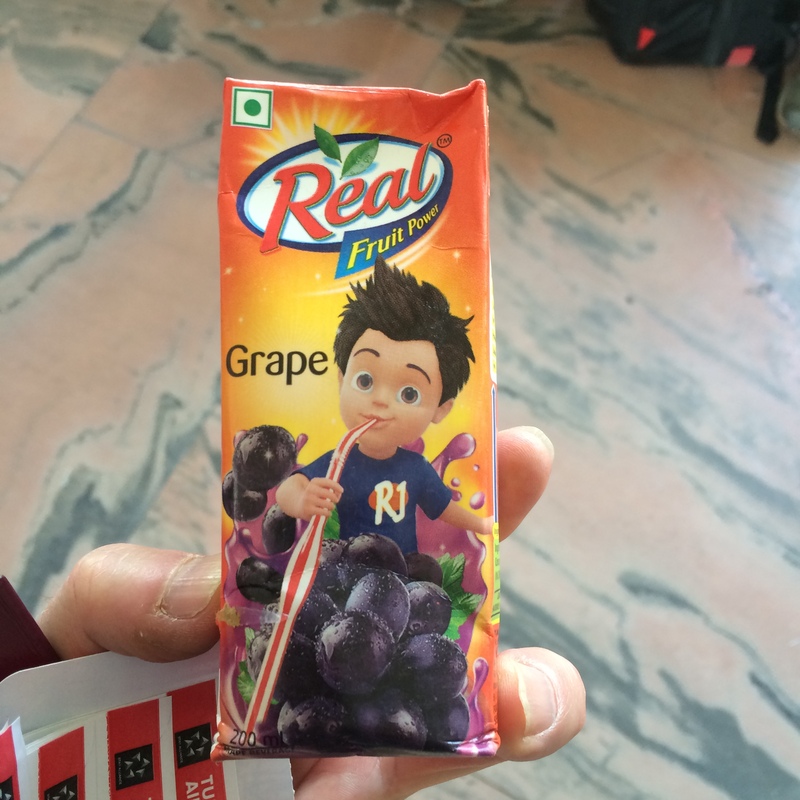 Vastly cheaper than an imported bottle of cheap, branded Chilean Cabernet from an air conditioned wine room in a smart Durbar Marg restaurant, and much more interesting. The 2014 we tried, and bought, has 12% alcohol. One of the pleasures of having a family member living in Nepal currently is the opportunity to meet people, both locals and Westerners. Our daughter is acquainted with a wonderful American called Laurie Lange, who is studying in Kathmandu for much of the year. Although her wider family has a long winemaking history, she has no direct experience herself, but she is both a creative and focussed individual with, seemingly, a genuine talent for anything she turns her hand to (successfully having grown mushrooms, for example, she also spends part of the year as a tour guide in Alaska). Laurie makes wine in Kathmandu. In effect, it’s home winemaking. Most of her tools of the trade, including yeasts, hydrometer etc, came in a suitcase. For fermentation vessels she cleverly uses the ubiquitous drinking water containers so essential in Nepal. They hold around 20 litres of drinking water and you see them the world over, everywhere from airports to doctors’ surgeries, blue plastic attached to a levered tap (usually with a stack of plastic cups on the side). Onto these she affixes the air locks we normally see on demijohns, which seem to work well. 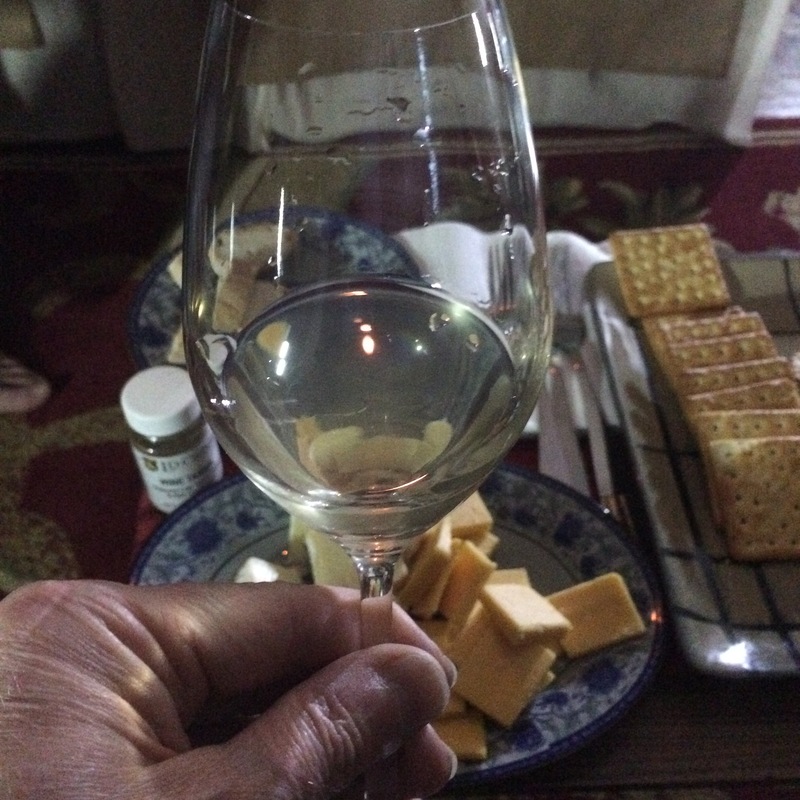 Laurie began by making a white wine from locally purchased grapes which, in Kathmandu, come in from India. March is a good time for grapes, and indeed for all fresh fruit which, despite a long overland journey on dusty roads, looks pristine on the street carts and in the fruit stalls. The grapes bear an uncanny resemblance to Thompson Seedless, although I’m afraid my ampelographical skills are wanting here. She’s calling the “brand” Chöying which is Tibetan and means “body of qualities: the basic state of all phenomena which holds all potentiality, all future qualities”. The white is slightly hazy right now, but remarkably drinkable. I stress remarkably. The wine reminds me so much of a Fendant (Chasselas) from Switzerland’s Vaud (more specifically, La Côte on the north shore of Lac Léman between Geneva and Lausanne). I have no idea why it tastes like a Mont-sur-Rolle, but it does. That means high acidity, but not breaking the boundaries of acceptability. I’d have liked to talk to Laurie a lot more – I’m sure she could offer me some good advice on our own wine making efforts. She’s done her research meticulously, and her main worry is the haziness of the juice. I hope it will fall bright in time. She told me in an email this morning that she plans to bring over some bentonite for fining next time she’s back in the States. There’s also a rosé fermenting, semi-sweet with an “undertone of grapefruit”. Laurie’s not sure whether she likes it, but I wish I could taste it myself. Maybe next year, Laurie? As I said at the top of this post, Nepal has its challenges. When you are spending an almost inevitable day in bed, when there’s no water for a shower in the morning, or when you are being followed by people wanting money, or to sell you trinkets, you do sometimes look forward to the luxury of getting home, I admit it. But when the time nears to leave, all such thoughts are banished. And when you do get home your thoughts immediately turn to when you might go back. 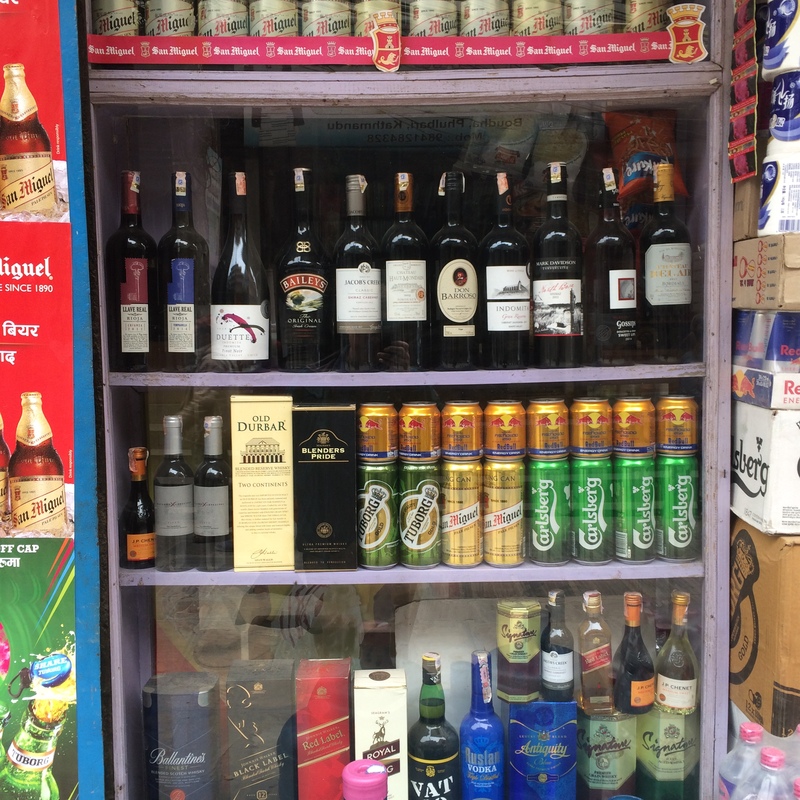 Typical Liquor Store, Kathmandu They do grow grapes in Nepal! This entry was posted in Nepal, UNESCO World Heritage Sites, Wine, Wine Travel and tagged Chöying Wine, Gorkha Beer, Hill Hut Winery Pokhara, Kathmandu, Khainori Grape, Manakamana, Pataleban Vineyard, Sherpa Beer, Wine in Nepal. Bookmark the permalink. 4 Responses to Is This the Outer Edge of the Wine World? Amazing account David, you give a very real picture of the country. It sounds indeed that they are both blessed and blighted. It has certainly made me want to find out more about Nepal. I’m amazed that you were able to include wine in your itinerary and it is interesting to see how people strive to make wine in the most unpromising circumstances. I admire your knowledge of Japanese varieties as well as your ability to compare a wine to Swiss wines amongst others, encylopaedic. Good to have you back though I suspect your heart and mind may still be there for some time. Thanks, Alan. Part of me is still there, for sure. Of course, can you really imagine I’d go anywhere and not explore the wine scene? I am lucky – I’ve been to Japan a lot, and two of our best friends live in Geneva. I’m quite a fan of Swiss wine. You just don’t see much outside the country.